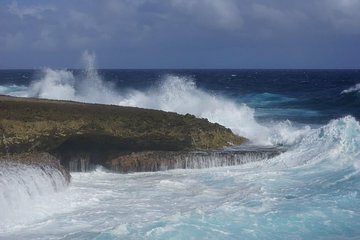 Visitez la côte nord-ouest de Curaçao, où le vent fort qui se dégage de l’eau crée des phénomènes comme une fontaine naturelle et un jacuzzi. Au cours de cette visite de quatre heures avec un guide local, explorez le parc naturel de Shete Boka, où le «souffle de Curaçao» crée de puissantes vagues sur la côte, ainsi que la grotte Boka Tabla et le pistolet Boka, un canon à eau naturel. Parcourez le parc à bord d'un véhicule 4x4 à toit ouvert, de manière optimale pour prendre des photos, et profitez du transport aller-retour à partir de la plupart des hôtels locaux et du port de croisière. Allen made this tour extra special. We saw so many wonderful places on the island and in addition, his knowledge of the history and other aspects of the island made for a great experience. Was a memorable experience. Guide was very knowledgeable, and we really enjoyed the trip. It was really the only way we could have seen these sights without a 4wd vehicle of our own. Enjoyed our tour with Elmer as our guide. Loved the drive through the mini desert of Curacao. We were educated on the use of Curacao for bombing training in WWII which was very interesting.The description for this tour mentioned a couple of sites that we would visit which we didn't: Suplado, the natural jacuzzi, the Boka Tabla cave. A bit disappointed that we didn't see these. Sampled the yummy blue curaçao liquor in a nice shady spot and had a relaxing 2 hrs at Mambo beach surrounded by shops and eateries behind us. Rented chairs and shade for only 3.50. Great tour guide. Amazing tour, awesome guide! The Boka Pistol is a must see, you can't come to Curaçao and not do this tour! We also saw flamingos that were too lovely! Thank you George! This tour was great and so were the two guides, Gitland goes by George and Howard. Howard is a jokester and George the straight man and they played off of one another to give us a few laughs. We had two vehicles and they were equipped with a loud speaker so the guide/driver could point out various things to us. Warning--the tour takes some extremely rough dirt roads and the ride is kind of wild. However, you get to see things that are not available from the paved roads. We spotted a beautiful wild parrot among other creatures. We really enjoyed this tour. Our tour to Shete Boka Natural Park in Curacao was amazing. The power of the waves crashing into the shore was phenomenal. Elmer, our driver, was very professional, kind and knowledgeable. He was able to show us sights that most people don't get to experience. This is the second time we booked a Viator tour on our travels, and have had excellent experiences both times. They offer great tour choices with local, professional tour guides. We loved our tour. Had a great experience with our guide Howard, He was very knowledgeable and had a great sense of humor. We had booked a half day tour and it lasted 5 hours. Well worth the money. The trip is a bit bumpy as you are in a jeep going over some rough terrain, but they clearly post it on their web site. I would recommend this tour. This Jeep tour was made wonderful by our funny and animated guide, Howard. We visited the widely uninhabited side of Curacao, driving along the coast where we saw water cannons shooting up from rock openings created by the ocean, sea turtles foraging for food in the Boka, and Kunuku Houses. Howard was very knowledgeable about his Island, and entertaining during the entire tour. This is a wonderful excursion for those who do not have mobility or back problems as advertised, since you need to climb steps to enter the back of the jeep, which seats 8, and the terrain is a bit rough when you are off-road. Wear sunscreen and enjoy! Due to the arrival time of our cruise ship, we had a personalized tour with our guide, George. We truly enjoyed this trip. We were able to see the sights, take our time to enjoy them, and hear a wealth of information from George. We were able to ask and receive answers to all of our questions about Curaçao and each of the places we visited.